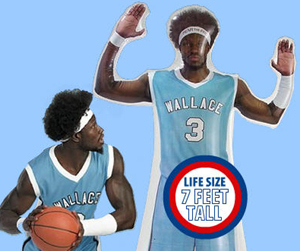 So here's a phrase you weren't ready to hear on a Thursday morning: "Ben Wallace Blow-Up Doll." Detroit Bad Boys has the story; a product meant (apparently) to help kids deal with seven-foot tall Afroed centers called The Inflatable Defender. The idea is that you blow up Ben and then, uh, just kind of put him in your driveway and let your kids drive around him. Definitely don't elbow him, though, or you'll end up with one of those neighborhood brawls. When we received the email this morning informing us of the "NBA blow-up doll," we'll be honest, we had thought of something else entirely.